Climate change is real and is happening. The changing weather patterns are going to have a huge effect on world economies, food production, human health as well as the frequency and severity of natural disasters. Can we as individuals do anything about it? With greenhouse gas emissions from electricity generation accounting for nearly 27% of annual emissions in the UK, replacing domestic power generation with a zero carbon solution would seem like a good place to start. There are several renewable options for this but I’ve chosen to look at solar because it’s simple to implement in a domestic environment. So what do we need to do to make an average UK household entirely solar powered? The UK isn’t known for it’s sunny climate. It’s often cloudy, and in the winter the days are short and the sun barely creeps more than 15° above the horizon. Is UK off grid solar possible? And if so is it practical? The typical annual energy from the sun (insolation) in the southern United Kingdom is about 1100kWh/m². That’s an average power of 125W/m² . Not too shabby at all! The graph shows a year’s worth of generation with months along the x-axis and the time of day on the y-axis. 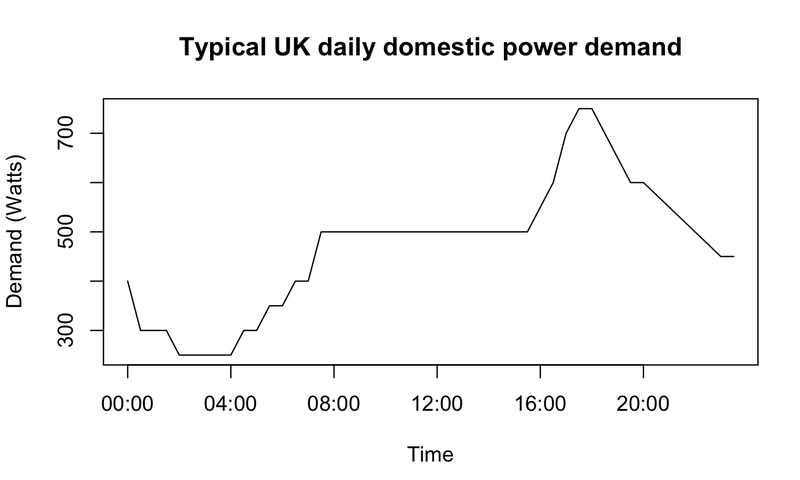 You can see the variation in day length as well as the variation in peak power output during the year. Periods of good and bad weather are also apparent as vertical bands throughout the graph. The large period of low generation in the mornings is probably due to this installation being aligned towards the southwest rather than due south and so is not collecting direct sunlight until later on in the morning. For an off grid system we’ll need to add some excess capacity to our solar installation to account for the seasonal variation, and to deal with the daily variation we’re going to need to store some of the power for use later. This is achieved by charging batteries and discharging them when solar generation drops below the power demand. So what size panels and what size battery do we need to be totally off grid and still enjoy a 21st century lifestyle? This is good to know for our calculation because for a considerable period of low generation we’re not consuming much power and so don’t need such big batteries as we would if we just worked with a constant average value. We also need to take into account variations in consumption between winter and summer which I have taken to be the average level +/- 30%. Now let’s add some typical costs to our model. For the batteries I’m going to use the value of £160/kWh quoted for the Tesla Powerwall. For the panels I’m using the cost of the installation that provided the generation data, which works out at about £1500/kWp. 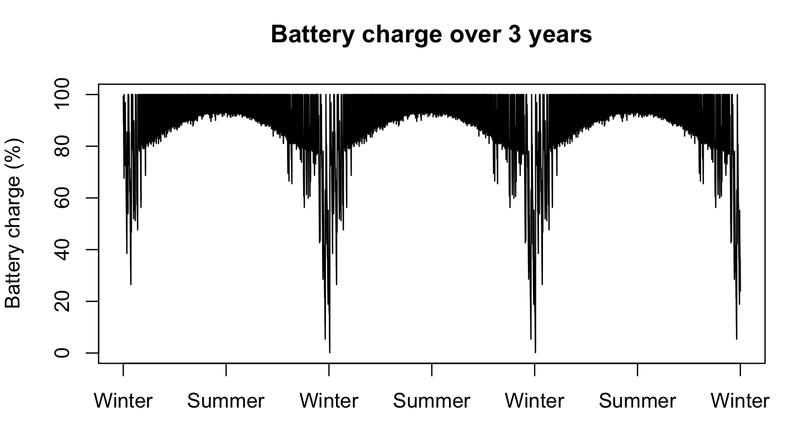 The black areas show the battery cycling each day for three years, with deeper discharges visible during the winter. It can be seen that for most of the year the battery reaches full capacity during the day and so unless the load is large enough the huge excess of solar power generated will be lost. Also between 80% and 90% of the battery capacity is surplus to requirements during the summer months. For a few weeks over the winter however, the large panel and battery are working to their limits and without them the lights would start going out. The dramatic deterioration in performance during the winter is probably due to bad weather, including snow covering the panels, as well as the sun becoming obstructed by nearby objects when it’s very low in the sky. We shall see later how this problem can be mitigated. 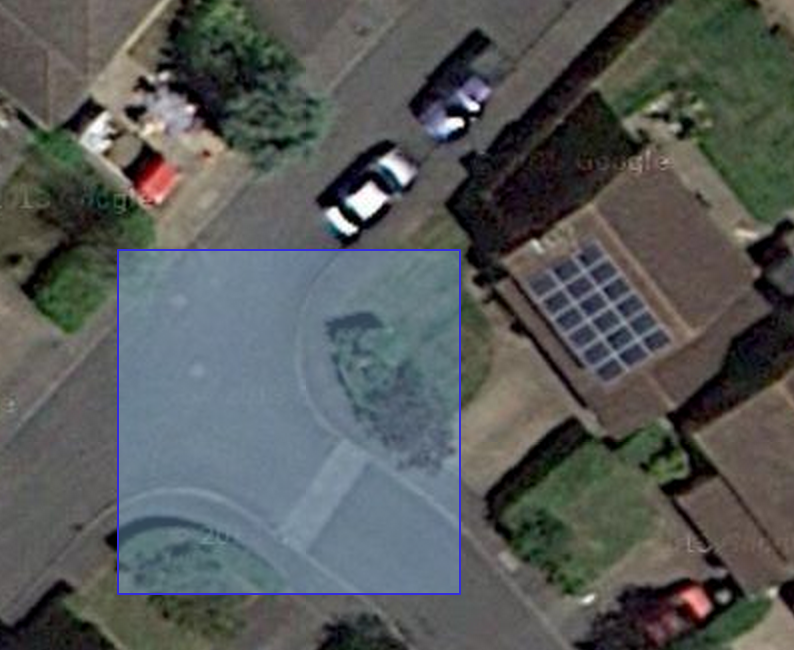 It turns out that according to our model we can run a completely off grid household in the UK with a 37.62kWp solar installation and a 59kWh battery. The estimated cost of such a system would be about £64440 (about $100,000). Although large, this is not outside the realms of possibility for a green minded individual, given that the starting price of a Tesla Model S is £50,000. It’s big, but not excessively so (slightly smaller than a tennis court), and while it’s not suitable for towns, such an installation could appeal to rural households. A huge amount of the cost goes into building extra capacity into the system to make it work over the winter when, in the case of our model, the sun is low or the panels are obscured. This over capacity results in a massive excess generation — over 30,000kWh — which is wasted as it can’t be stored. Clearly this energy could be used during the summer to do something useful and potentially offset the cost. Alternatively the overcapacity could be dispensed with and the system augmented by a fossil fuel generator during the winter. This would reduce the system specification considerably while still significantly reducing the overall annual CO2 emissions. Using a backup generator for a few hours a day for just one month of the year would nearly halve the panel and battery size, resulting in a cost reduction of 45% to £34400. Such a hybrid system would strike a balance between sustainability and reliability of supply. We’ve seen that domestic off grid solar is theoretically achievable in the UK, although it’s not suitable for all households due to the area required for the panels. The price is also very high. Even for our cheaper hybrid system, in the first year the electricity produced will cost over £8 per kilowatt-hour, that’s 80 times more than the current cost of electricity from the grid. Even after 20 years of service, ignoring maintenance costs, the price will still be 40p/kWh. Unfortunately the current price of fossil fuels is such that renewables will never be able to compete on price alone. We’re not going to run out of fossil fuels anything like soon enough for the economics to make zero carbon alternatives preferable before we reach the point that climate change is irreversible. The good news is that the technologies to solve the problem exist right now, and we don’t have to change anything about our high energy consumption lifestyles if we don’t want to. But if we’re serious about making a difference, we’re going to have to pay for it.